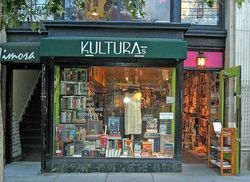 KULTURAs books established in Wash.DC. in 1989. We have operated numerous locations in DC from Adams Morgan to DuPont Circle, as well as two locations in Los Angeles. We hope to continue our bi-coastal asperations in the near future. Our Stock is expansive in nature, from the exceptionally rare book to the common trade paperback. Specialties include Modern First Editions, Art, Architecture, Photography, Fashion Philosophy, Poetry, Latin American Studies, and Foreign Languages. We are also a Contemporary Modern Art gallery space.